A Watercress Recipe Transformed into a Watercress Smoothie! Looking for a watercress recipe to eat your nutritious watercress? Well, try a watercress smoothie and receive many benefits from watercress. I was at the local co-op yesterday and saw a whole bag of watercress on sale. So I bought four bags. What did I do with all of that watercress? I put them in my green smoothies! Now… I did not add all four bags into my blender. Watercress has a very distinct flavor. The flavor is a little peppery and spicy. So I recommend that most people use only a handful in a large smoothie at a time. I found that by mixing it with baby spinach I could hardly taste the strong flavor of the watercress. You could use one small handful of watercress and one large handful of spinach in a single smoothie… and still enjoy it. Since I use just a handful of watercress greens in my smoothies, I didn’t want to waste the other watercress. So I washed it up and froze it in the freezer in single-sized servings. This way I can add it to future smoothies or even crush it up while frozen and toss it into soups or casseroles. According to Dr. Fuhrman in his nutritional analysis, watercress is up at the top with some of the other most nutrient dense foods (like kale and mustard greens). I was impressed with the amount of nutrients in watercress. 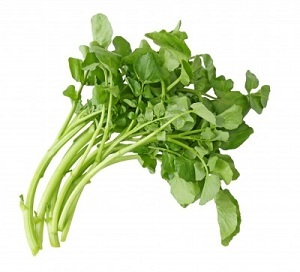 Watercress contains large amounts of vitamin A, C, K and Omega fatty acids. Also, for those who do not have a high-powered blender... watercress fits in the category of tender greens along with spinach and baby greens. It blends quite easily. But for beginners trying a green smoothie for the first time, I would not recommend watercress as the first green to blend. For those who have been blending green smoothie recipes for some time, go ahead and try adding a little watercress with your other greens. You just might like it.